Eggplant belongs to the nightshade family, same as the tomatoes, potatoes and peppers. 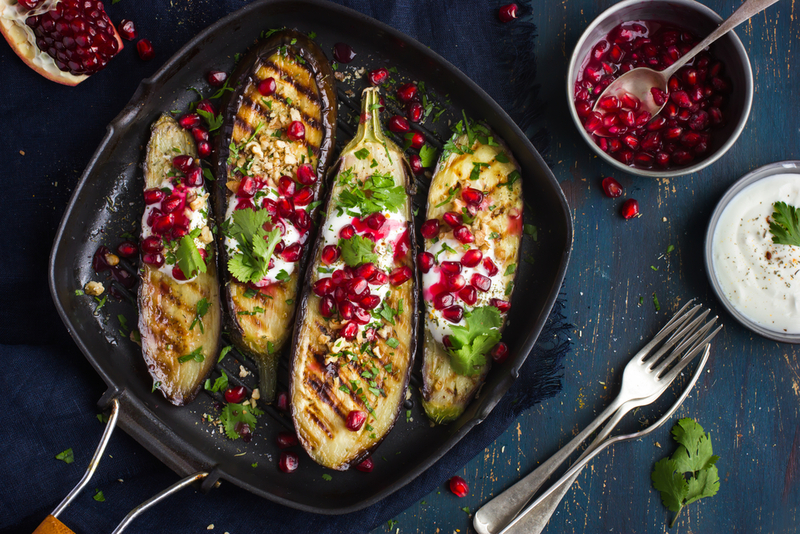 It might surprise you that eggplant is botanically classified as the berry. This special ‘berry’ contains numerous small and soft seeds and has white flesh with a meaty texture. It comes in different varieties, distinct in their shape (round or skinny), size (small or long) and color (indigo or white). There is a bitter taste of eggplant because of its nicotinoid alkaloids composition. Eggplant is believed to be originated from the Indian subcontinent. It is now cultivated in tropical, subtropical and temperate zones and is enjoyed as part of different cultural cuisines all over the world. The name eggplant, as we commonly know, is the name used in North America and Australia. The same vegetable is called aubergine in British English and French, and brinjal in South Asia, Southeast Asia and South Africa. The wonderful health benefits of eggplant are primarily due to its vitamin, mineral and nutrient content. A deficiency in iron leads to anemia which is characterized by headaches, migraines, fatigue, weakness, depression and cognitive malfunction. 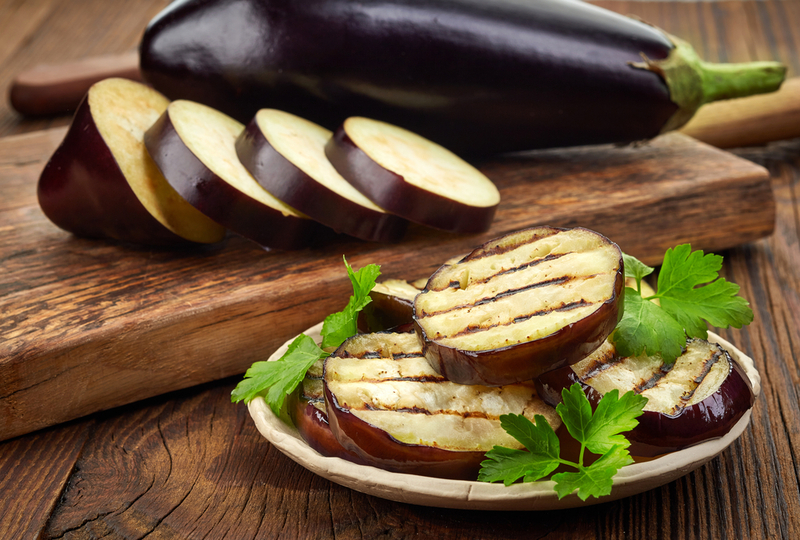 Eggplant provides a decent amount of iron in their meaty fruit to combat anemia. Moreover, eggplant is also a good dietary source of copper, another essential mineral for red blood cells synthesis. Eating eggplant provide you two minerals essential for having healthy red blood cells coursing through your veins. People reported the alleviated feelings of fatigue or stress and boosted energy and strength. There is a wide spectrum of phytonutrients in eggplant exhibiting a good antioxidant activity: caffeic, chlorogenic acid and nasunin. Chlorogenic acid is also considered a potent antioxidant with many proven benefits. Nasunin is a flavonoid with powerful antioxidant capacity. 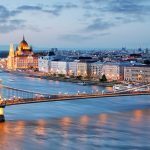 Animal studies have found that nasunin protects lipids in brain cell membranes to ensure its normal functionality under oxidative stress. Having an adequate amount of antioxidants in our body is essential to protect our organs from harmful infections and diseases, including cancer and heart disease. Eggplant contains quite high content of potassium (~ 217 mg/100 g) and low level of sodium (3 mg/100 g). The high potassium-to-sodium ratio is beneficial in preventing hypertension. Moreover, the nasunin in the skin of the eggplant is an excellent antiangiogenic phytonutrient help control hypertension by restricting the growth of new blood vessels and keeping blood vessels clear and relax. Research studies showed that eggplant contains bioactive components blocking angiotensin-converting enzyme (ACE) which is also the target for popular blood pressure drugs of captopril, Lisinopril and ramipril. 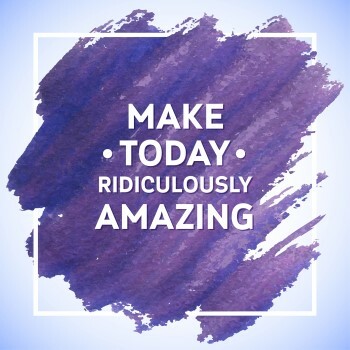 Eggplant has been called “brain food” because of its wonderful content of phytonutrients known as boosters for cognitive activity and general mental health. These phytochemicals increase blood flow and thus more oxygen to the brain; stimulates the development of neural pathways; and boost the memory and analytical capability of our brain. One special bioactive compound of eggplant is nasunin, a type of anthocyanin present in eggplant skin, that is specially linked to prevention of detrimental deterioration of the brain. 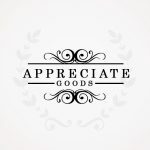 Free radicals are one of the culprits that are responsible for the neural degeneration and the appearance of Alzheimer’s disease and dementia. Clinical evidence is mainly based on animal studies, but it is encouraging news for patients suffering from cognitive disorders. The high potassium content in eggplant acts as a mediator of vasodilation which helps to prevent stroke and high blood pressure. Eggplant is also a great source of vitamin B1, B3 and B6. 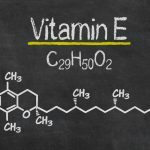 The group of B-vitamins plays an essential role in the proper function of the central nervous system, energy production, hormone balance and liver function. Vitamin B enzymes are essential for synthesizing enzymes for fat, carbohydrate and protein breakdown in energy production. A cup of boiled eggplant provides you 0.08 mg of vitamin B1, 0.63 mg of vitamin B3 and 14 mg of folate. Antioxidants are one of the body’s best lines of defense against a wide variety of cancers. Dietary antioxidants scavenge the free radicals, which are by-products of normal cellular metabolism in our body that can attack healthy cells and deconstruct the DNA into potential carcinogenic cells. Eggplant is an excellent source of antioxidants. It is ranked as one of the top ten vegetables in terms of oxygen radical scavenging capacity due to the fruit’s phenolic constituents. Anthocyanins, an important group of naturally occurring pigments of red and purple colored fruits, are the main phenolic compounds in eggplant peel. Studies have shown that anthocyanins may act as anti-cancer agents by inhibiting the progression of tumor cells. Other antioxidants in eggplant, such as the nasunin and chlorogenic acid, are potent antioxidants which prevent angiogenesis in cancer cells. Eggplant also contains a high content vitamin C which stimulates the production and activity of white blood cells to ensure the proper functioning of our immune system to detect and eliminate the cancer cells. 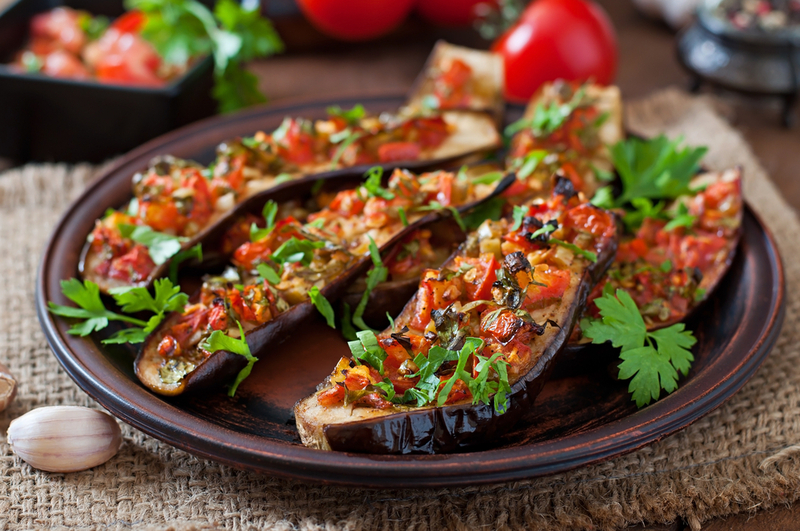 Eggplant is an unusual vegetable that helps build strong bones and prevent osteoporosis. This wonderful benefit for bone health is primarily derived from its vitamin and mineral content. The phenolic compounds in eggplant peels have been linked to reduced signs of osteoporosis, stronger bones and increased bone mineral density. It also contains a significant amount of iron and calcium which are key to bone health and over strength. Firstly, the high fiber and low soluble carbohydrate content of eggplant make it a healthier choice peoples with high postprandial glucose level. Secondly, the anthocyanins present in the peel of eggplant is a potent inhibitor of digestive enzymes such as alpha-glucosidase and alpha-amylase. Suppress the activity of these two enzymes is typically used the drug design for type II diabetes. As such, this plant-based enzyme inhibitor from eggplant is a promising healthier solution to modulate and manage diabetes. The fiber content of the eggplant helps to reduce cholesterol and relax blood vessels, both aids to maintain good heart health. The antioxidants in eggplant help eliminate oxidative stress to the cardiovascular system and thus decrease the risk of heart attack and heart disease.Moreover, the balanced potassium content ensures that body is kept hydrated. Eggplant is a good source of dietary fiber which is known to be critical for gastrointestinal health. 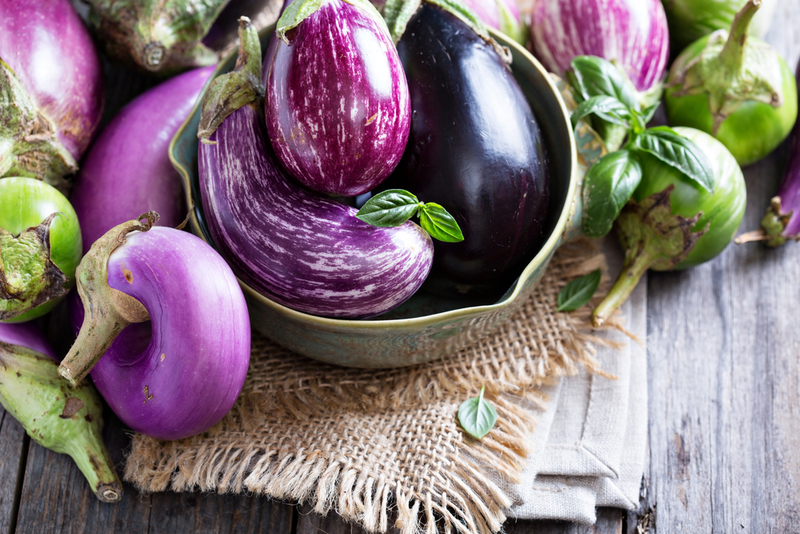 One whole unpeeled eggplant has more than 16 g of fiber. 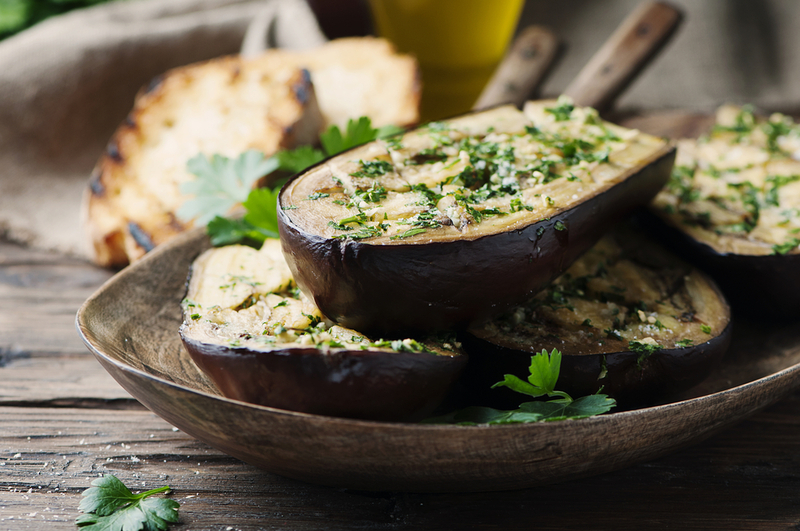 One cup of eggplant contains about 8% of the daily values of dietary fiber. 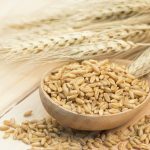 Ingestion of adequate amount of fiber help to stimulate your bowel movement, relieve constipation, hemorrhoids and colitis. Since eggplant contains almost no fat or cholesterol and at the same time contains a large amount of fiber, it is a very good choice for those trying to lose weight or fight obesity problems. The fiber inhibits the release of ghrelin, the hormone that is responsible for signaling the hunger to our brain. By reducing our appetite and increase satiation, the chances of overeating are reduced. Your heart is another beneficiary of eggplant. Eating eggplant boost your dietary fiber intake which is known to be linked to a reduction in heart disease. 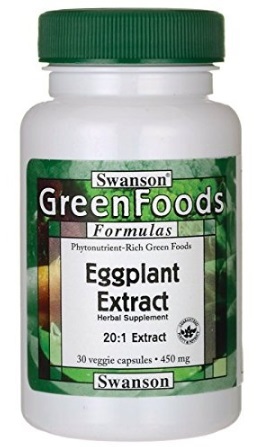 It reduces the risk of atherosclerosis, heart attacks and strokes by eliminating the “bad” cholesterol (LDL cholesterol) that can clog arteries and veins, and stimulate the uptake of “good” cholesterol (HDL cholesterol). Also, the bioflavonoids in eggplants are great for reducing blood pressure, which reduces the stress on the cardiovascular system. Eggplant is a rich source of folic acid, which makes it particularly beneficial or pregnant women. Folic acid protects the infant from neural tube defects which can manifest in a number of ways. Therefore, it is always recommended that expecting mothers increase their folic acid intake. Eggplant is considered as one of the healthiest food options and is safe for the general population. 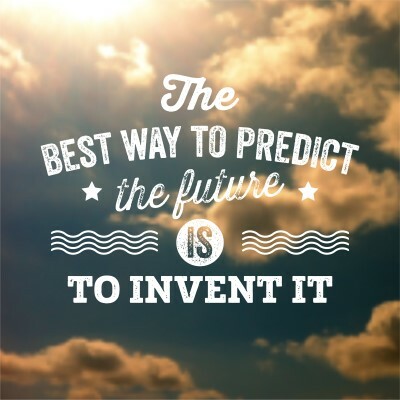 However, precautions should be taken for people with special conditions. For people with low iron levels: Eggplant contains nasunin that can bind with iron and removes it from cells. It will not cause a problem if there is an excess or adequate amount of iron in the body. However, it is not recommended for those with low iron level to consume a large amount of eggplant which might increase the risk of iron deficiency. For people with kidney stones: The oxalates in eggplant can lead to the formation of kidney stones and the kidney stones can lead to acute oxalate nephropathy or even kidney death. Hence, people prone to the kidney stone formation are not recommended to consume eggplant on a regular basis.For those already suffer from kidney stones, limited amount eggplant, shall be taken. For pregnancy women: Eggplant stimulates menstruation because of its diuretic nature. Thus, it is not advisory for pregnant women to eat eggplant on a regular basis. Eggplant is considered as the King of Vegetables in India. 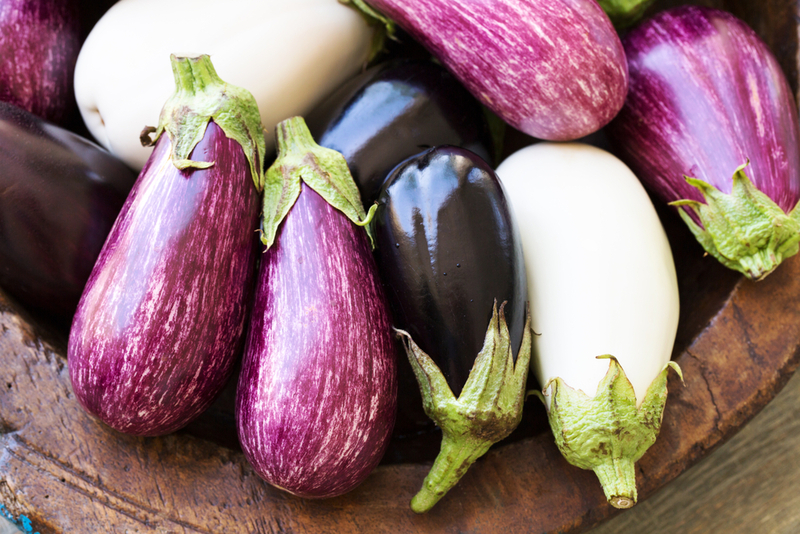 The first variety of eggplants were smaller, white or yellow in color and shaped like an egg when it was cultivated the US, Australia and Canada. This is where the name “eggplant” comes from. Among all the vegetables, eggplant has the highest level of nicotine. You are reminded that nicotine is no more harmful than caffeine. Because of the high content of nicotine, the seed of eggplant is addictive. The amount of eggplant to provide the similar amount of nicotine in one cigarette is 10 kg. Eggplant is one of the few edible nightshades plants. 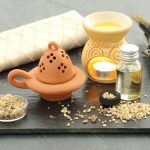 The nightshades family has a fairly long list of poisonous One of the most famous nightshade toxins is belladonna, also known as the “deadly nightshade”. Eggplant was normally salted and rinsed to remove some of the bitterness. Most modern varieties of eggplant are bred to remove the bitterness so that salting is no longer necessary during cooking. Eggplants and tomatoes are They both belong to the nightshade family with the famous literary poison – deadly nightshade. But don’t worry, eggplant is not toxic (at least not in normal amounts). Same as the tomatoes, eggplant dislikes the cool temperature in the fridge and is best to be stored under room temperature. Eggplant from Saudi Arabia is an exception in having relatively high level of iron. Eggplant is believed to be originated from the India subcontinent where it grew in the wild. It is dated back to more than 1500 years ago when this wild fruit was still spicy, bitter and in pea-size. It is an important vegetable in Old World. The earliest written record of the eggplant was documented in ancient Chinese literature, Qi Min Yao Shu, work from 59 BC. 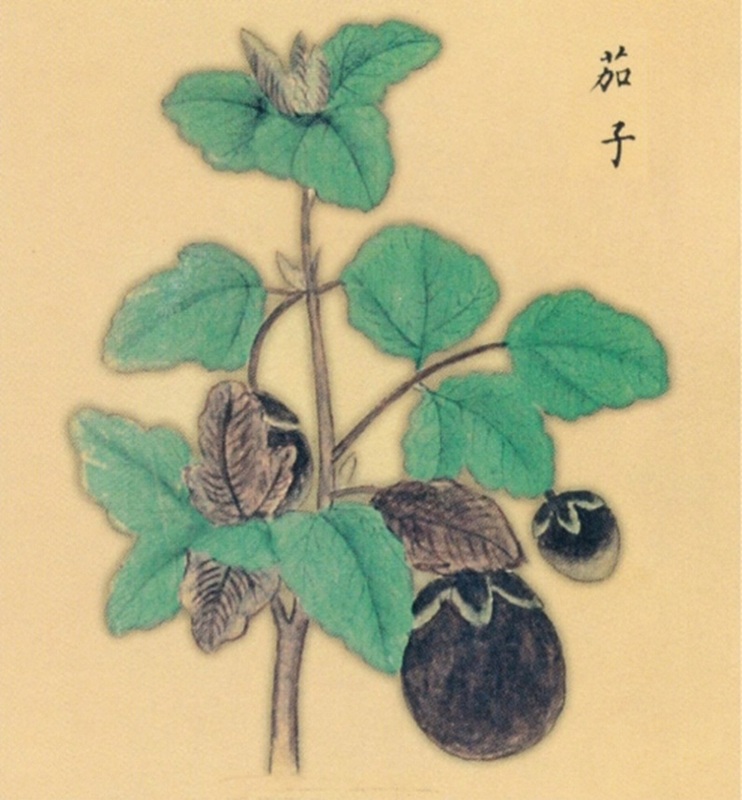 Coloured drawing of eggplant from Lüchanyan Bencao in ad 1220 (South Song Dynasty). Then eggplant was introduced to Europe by the Arbs and to Africa by the Persians. The eggplant was believed to cause insanity in 13th century traditional Italian folklore. People believed that anyone who ate the “mad apple” was sure to go insane when eggplant was firstly introduced to Italy.The insanity was “more common and more violent” when it comes to the eggplant season in summer. 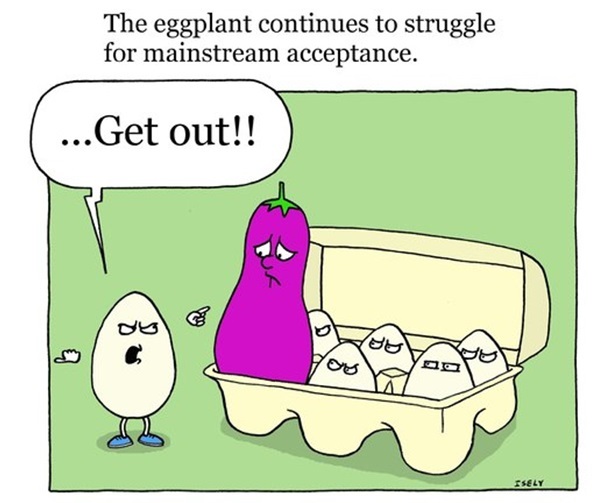 It was until the early 1800s when eggplant was carried by the Spaniards to the New World, America. Nowadays, theglobal production of eggplant was 49.4 million tones. China is the top producer of eggplant. India, Iran, Egypt and Turkey are the major producers. In China, as part of her “bride price,” a woman must have at least 12 eggplant recipes prior to her wedding day.